A number of the faithful spurned watching the internationals on the box and set off to watch the free-flowing Foresters in glorious sunshine in Harrogate. It turned out to be quite a different afternoon. The teams lined up for a minute’s silence in honour of Remembrance Day and the 100th Anniversary of the Armistice. The Harrogate pack looked massive and it was expected that it would be up to the Forester’s superb back division to win the game. In the end it was the Green Machine eight that won the battle with a massive push over try. A fitting way to end the match that had been a good-hearted battle for 80 minutes. Harrogate got on the scoreboard first when the ball was gift wrapped to them on Dale’s 22. From broken play they attacked and 5 phases later crossed for a converted try. Dale struck back almost immediately from an attacking line out. A good catch and drive led to Tom Jackson touching down for an unconverted try. Harrogate finished the half with again being given possession in Dale’s half, and quick ball to the right found the right winger in space to run in for an unconverted try. A yellow card apiece at the start of the second half created a bit more space on the pitch. A cross kick from Will Bell was collected by Ralph Wellock. The winger still had work to do and beat the cover tacklers to score. Bell’s conversion levelled the score at 12 all. The match looked to be heading for a draw until the Dale pack sensed victory in Harrogate’s 22. Gate had a scrum 8 metres from their own line. A punishing drive from Dale sent them backwards and Dale were awarded a penalty. The scrum was the obvious option as Dale were now driving forwards at the set piece. Away they went and drove the Harrogate 8 back to their line to give skipper Tom Whyte a try. 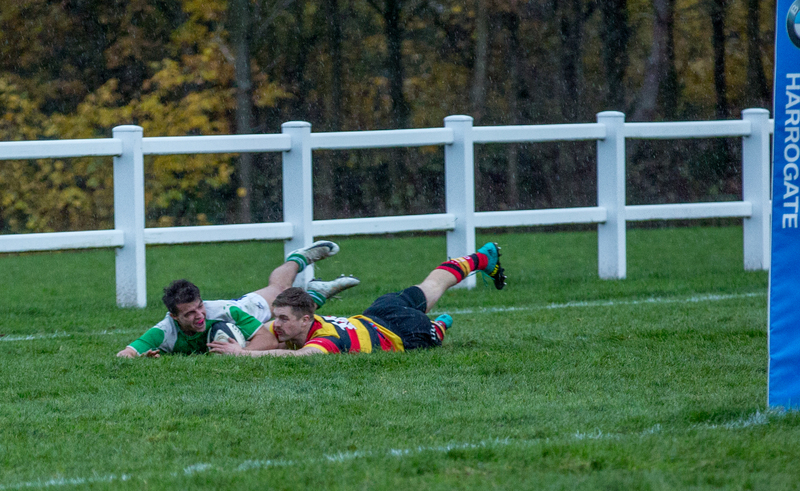 Rory McNab’s conversion stretched the lead to 19-12 and saw a superb close fought match end in Wharfedale’s favour.